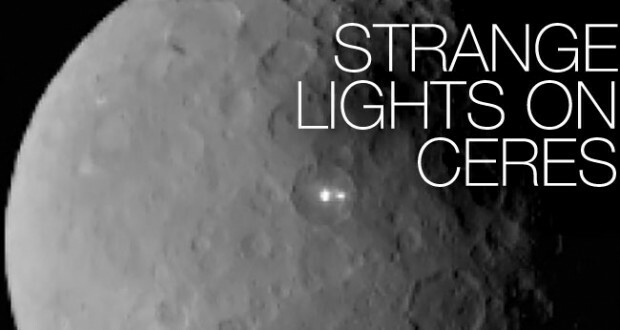 Scientists are perplexed by a pair of strange lights on the surface of Ceres–a dwarf planet in the asteroid belt between Mars and Jupiter. NASA’s Dawn spacecraft photographed Ceres on February 19 from a distance of approximately 29,000 miles. Although regions of higher-than-average reflectiveness have been seen on Ceres before, these new photos from Dawn show two bright spots within the same basin on the dwarf planet’s surface. “The brightest spot continues to be too small to resolve with our camera, but despite its size it is brighter than anything else on Ceres. This is truly unexpected and still a mystery to us,” said Andreas Nathues, lead investigator for the framing camera team at the Max Planck Institute for Solar System Research in Germany, in a recent NASA press release. 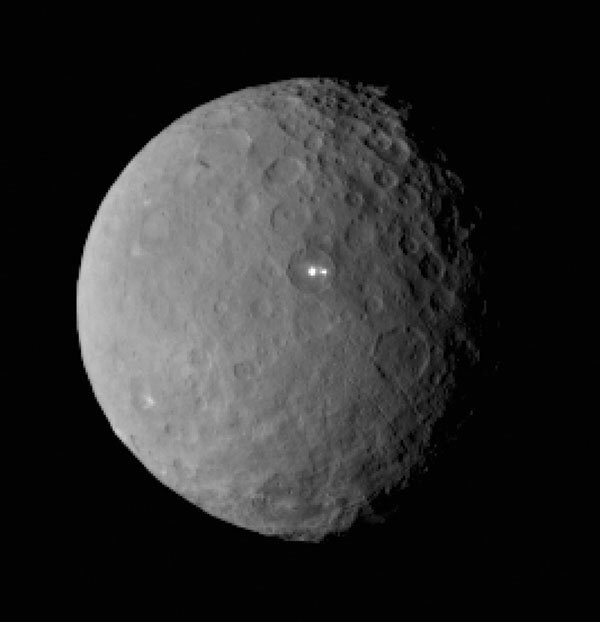 NASA’s Dawn spacecraft will enter orbit around Ceres on March 6, and will continue collecting better photos of the dwarf planet and its mysteries during the next 16 months. With better photos, scientists will hopefully be able to better determine if the strange bright spots on Ceres are signs of an extraterrestrial civilization, or if they indeed have a volcanic origin. 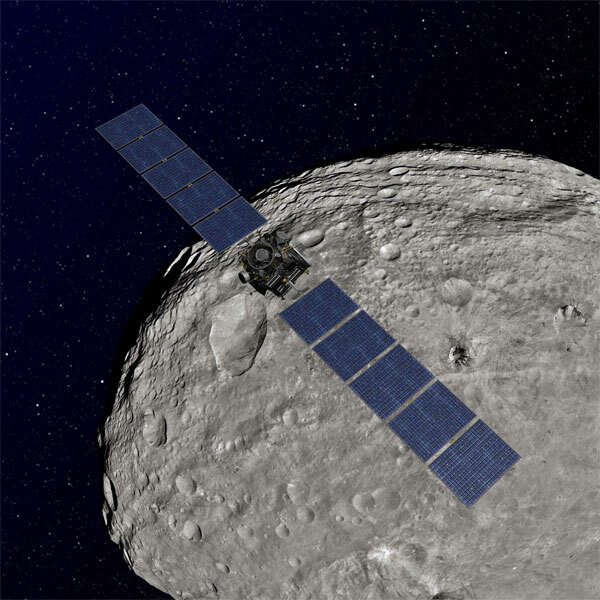 Jason, I have just read how studying Ceres will help us understand more about the origins of planetary bodies, all sorts of reasons are put forth to justify the sending out of space probe`s. Take 67P for instance, landing Rosetta on this asteroid was going to help us understand more about our solar system. But the thing is no one ever explains how, no one ever shows you how sending out these craft will help our understanding of the Universe . We just except everything we are told and let them carry on, the media is just as bad, they just echo the same rubbish, no reporter or interviewer has ever ask “How will all the data we collect help us to understand? please explain to the viewers . Well most television shows would lose viewers if they started getting into all the technical details of planetary formation. Just because they don’t say doesn’t mean there isn’t a reason. WHERE THE HE’LL ARE THE NEW PICTURES OF CERES???? IT’S BEEN IN ORBIT OVER A WEEK AND THE YEAR JUST STOPPED POSTING NEW PHOTOS.